Tobacco Addiction - body, causes, What Is Tobacco Addiction? There is no such thing as a safe tobacco product. The use of any tobacco product, even ones that are labeled "low tar," "naturally grown," or "additive free," can cause addiction and health problems. Likewise, the use of tobacco in any form, including cigarettes, cigars, pipes, and smokeless tobacco (chewing tobacco or snuff), is harmful. Although cigarettes are the most popular form of tobacco, others are common too. The 1999 National Youth Tobacco Survey was the first study to look at the use of all kinds of tobacco products by young people nationwide. Of the high school students in the study, about 15 percent sometimes smoked cigars, and sizable numbers also used smokeless tobacco (chewing tobacco or snuff), kreteks (clove cigarettes), or bidis (small, flavored cigarettes from India). Nicotine narrows the blood vessels and puts added strain on the heart. Smoking also causes shortness of breath and reduces the amount of oxygen that is available for the muscles and other body tissues to use. These changes can limit people's ability to do the things they want to do. In young people, sports performance can suffer as a result. For example, many smokers cannot run as far or as fast as nonsmokers. Tobacco use also makes people less attractive. It stains teeth and causes bad breath, yellowed fingers, and smelly clothes. In addition, even brief use of smokeless tobacco can cause cracked lips and white spots, sores, and bleeding in the mouth. * larynx (LAYR-inks) is a structure in the throat, composed of muscle and cartilage (KAR-ti-lij) and lined with a mucous (MYOO-kus) membrane, that guards the entrance to the windpipe and serves as the voice organ. * esophagus (eh-SOF-a-gus) is the tube connecting the stomach and the throat. Cancer: Smoking is a leading cause of cancer of the lungs, larynx * , mouth, throat, and esophagus * , and it plays a role in many other cancers. This is not surprising, since 60 of the more than 4,000 chemical compounds in tobacco and tobacco smoke are known to cause cancer, cell changes, or tumor growth. Lung disease: Smoking is a major cause of chronic bronchitis (KRO-nik brong-KY-tis), long-lasting inflammation of the breathing tubes or passages that connect the windpipe to the lungs, and emphysema (em-fi-SEE-ma), a long-lasting disease in which the air sacs of the lungs become overly large and don't empty normally. It also worsens colds and pneumonia (noo-MO-nya), an inflammation of the lungs usually caused by infection. Pregnancy problems: Smoking by pregnant women is linked to miscarriage * , stillbirth * , premature birth * , low birth weight * , and infant death. Women who smoke also are more likely to have trouble getting pregnant. * miscarriage (MIS-kare-ij) is the loss of a pregnancy before birth. * stillbirth is the birth of a dead infant. * premature (pre-ma-CHUR) birth means born too early. In humans, it means being born after a pregnancy term lasting less than 37 weeks. * low birth weight means born weighing less than normal. In humans, it refers to a full-term (pregnancy lasting 37 weeks or longer) baby weighing less than 5.5 pounds. 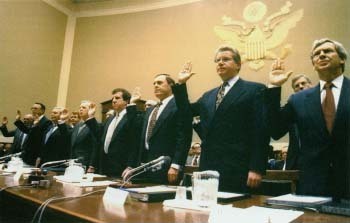 On April 14, 1994, top executives from Philip Morris, RJ Reynolds, and other major cigarette companies testified before a federal court about the addictive nature of nicotine. The tobacco industry also came under attack for targeting children and teens in their ad campaigns. In response, anti-smoking regulations have restricted cigarette sales and the ways in which cigarette companies can market their product. The nicotine patch and nicotine gum are sold without a prescription. The nicotine in these products passes through the skin or membranes lining the mouth and reduces the craving for tobacco. It is important to follow label directions carefully. In particular, people should not smoke while using one of these products. Young people under age 18 should check with a physician before trying the patch or gum. A nicotine inhaler * and nicotine nasal spray * are also available by prescription. Bupropion (Wellbutrin, Zyban) is another prescription drug that has been approved for use in smoking cessation. Using any of these products doubles a person's chances of success. * inhaler (in-HAY-ler) is a handheld device that produces a mist that Is breathed in through the mouth. * nasal (NA-zal) spray is a mist that Is sprayed into the nose. Drink a lot of water and other nonalcoholic fluids. American Lung Association, 1740 Broadway, New York, NY 10019. The ALA sponsors program to help people quit smoking and provides information and training about tobacco addiction and smoking cessation. American Academy of Family Physicians (AAFP), 11400 Tomahawk Creek Parkway, Leawood, KS 66211-2672. AAFP sponsors "Tar Wars," a smoking-prevention program designed for fifth-grade students. Stop Teenage Addiction to Tobacco, Northeastern University, 360 Huntington Avenue, 241 Cushing Hall, Boston, MA 02115. This organization's goal is to end childhood and teenage addiction to tobacco. Campaign for Tobacco-Free Kids. This site, run by the National Center for Tobacco-Free Kids, aims to protect children from tobacco addiction and secondhand smoke. Quitnet. This site, a project of the Boston University School of Public Health, offers helpful tips and tools for people who are trying to quit using tobacco. KidsHealth.org , a site run by the medical experts of the Nemours Foundation and the A. I. duPont Hospital for Children, posts information and artides on smoking, smoking prevention, and quitting for kids, teens, and parents.